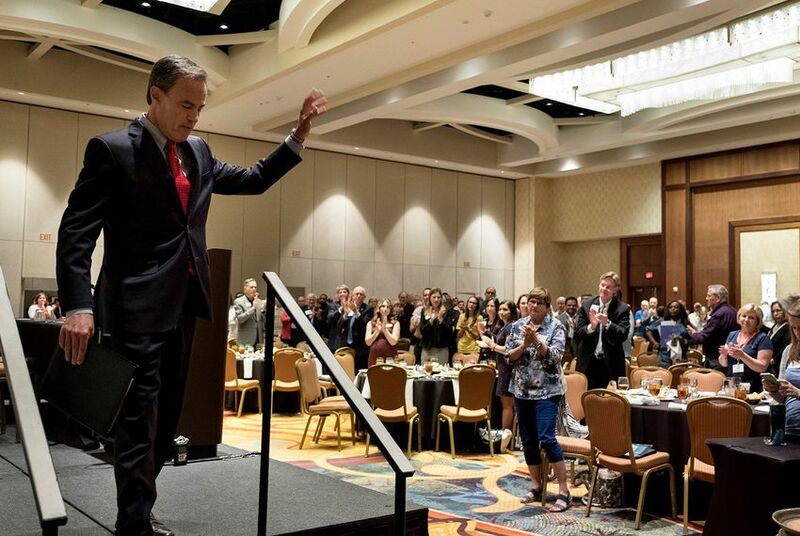 Speaking to hundreds of educators ahead of a special session packed with education bills, House Speaker Joe Straus chastised the Senate for underfunding school finance reform. SAN ANTONIO — Speaking to educators Wednesday, House Speaker Joe Straus took some jabs at the Senate for focusing on a bill to regulate public bathroom use instead of putting more than a billion dollars into public schools. The lower chamber's leading politician spoke about the upcoming special session to hundreds of school board members and superintendents in San Antonio on Wednesday evening at the Texas Association of School Boards' annual summer leadership institute. He urged educators in the room to keep speaking out for the issues important to public schools — and to act. "There have been a few of you who would make good members of the Texas Senate," he said, a joke that got him a round of laughter and applause. Straus' appearance comes as Texas legislators prepare to return to the Capitol for a July-August special session, with a packed agenda of 20 pieces of legislation Gov. Greg Abbott wants to see passed. Several of those bills would directly affect public schools, including a bill to regulate public bathroom use for transgender Texans. "I don't know what all the issues are with bathrooms in our schools, but I'm pretty sure you can handle them, and I know that you have been handling them," Straus said. He said the "bathroom bill" sends the wrong message about Texas, instead of "making decisions that attract jobs, that attract families." Abbott put several public education bills on the special session agenda, to be addressed only after the Senate passes crucial "sunset" bills that would keep several state agencies, including the Texas Medical Board, operating next budget cycle. He asked legislators to revive and pass two specific bills that died in the House — one that would create a commission to study school finance reform and one that would create a voucher-like state program to subsidize private school tuition and homeschooling expenses for kids with disabilities. School finance reform and "private school choice" died in the same bill late during the regular session. The Senate voted to attach a private school choice program to a major House bill injecting $1.5 billion into public schools. That angered the House, which staunchly opposes subsidies for private schools. Neither side would compromise. Straus said Wednesday that even if the House had compromised on private school choice, the Senate stripped about $1 billion in funding for public schools. "Even if we approved vouchers, they still cut out the vast majority of the funding we had proposed for public schools, so there was hardly anything left," he said. He said the school finance reform study was too little, too late. "The Texas House has been studying this for years. We already passed a bill that's a very strong first step," he said. "We can't keep kicking the can down the road." Abbott also put property tax reform on the special session agenda, pushing a provision the House excluded during the regular session to create automatic rollback elections when local property taxes rise by a certain amount. Educators have argued school districts must push for higher taxes because the state is underfunding public schools. Before Straus arrived, Bret Begert, school board president of Fort Elliott CISD, explained that his property-wealthy school district sends a large portion of its tax revenue back to the state through a program known as "Robin Hood," where wealthy districts subsidize poorer ones. "We don't mind sharing our money, but we don't want to go broke doing it," Begert said. The Senate and House deadlocked on several issues during the regular session, with Lt. Gov. Dan Patrick blaming Straus for blocking legislation that would restrict bathroom use for transgender Texans, cap property taxes and subsidize private school tuition for kids with disabilities. Straus blamed the Senate for holding sunset measures hostage. Abbott also added to the special session agenda two provisions that were not debated during the regular session. He called for a $1,000 increase in teacher pay and for more administrator flexibility on hiring and retaining teachers. Public education advocates worry this means schools will be required to do more with less funding. The governor said in his special session announcement that the increase in teacher pay could be done by "reprioritizing" spending, without additional funding. He also said principals and superintendents need flexibility "to retain and to reward the very best teachers and to replace those who are ineffective." Linking those two issues does not bode well for public schools, said Dax Gonzalez, the association's assistant director of government relations. "Something that districts don't want to get into the position of is giving raises to some by firing others," he said.